High Score Contests are the most basic form of contests available. When you play a game you reach a score, the highest scores will gain a prize. The prizes are displayed on the contest. All our high score contests add 2% extra to the pot. That is 2% over the amount played. Every time someone plays a game, the pot increases. The pot is kept as a decimal value, so 2% over e.g. L$25, being L$0.50, still counts. It is only rounded at the end of the round. Most of your High Score Contests run 24 hours, some don’t have a time limit but run for 1000 games. You can see on the board what sort of contest you are playing for. The ones that run 24 hours display a time left, the others display a number of games left. When a player makes multiple scores that are high enough to be on the contest, that player will gain multiple spots on the contest. * You could have a look at the boards before deciding what game to play. 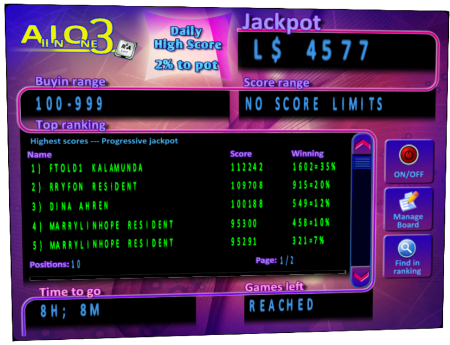 These contest have progressive pots, so you could find a contest with reasonable low scores reached and relativly high pots. Someone apperantly played a lot but didn’t gain very high scores. That could make it beneficial to play some games too. * When playing a game, play good, also after reaching a winning score. Perhaps even take a very agressive but more risky strategy, in order to score HIGH. But always first try to win the game itself, it is much more easy paying to play when winning your money back. * When you hold the first spots on the contest yourself and you are pretty sure you’ll keep them, you are also pretty sure that you take a big pie of the 2%’s added to the pot. A nice moment to play more? Or better not, as you already have the top spots.